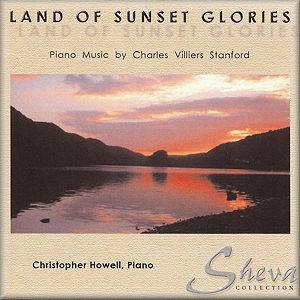 With this disc Christopher Howell investigates a necessarily targeted selection of Stanford's piano music. Care has been taken to cover a range of the oeuvre and he has not been neglectful of some of the earlier works either - specifically the Sarabande and the Gigue from Op.2. The result is a faithful reflection, and a good conspectus, of a side of Stanford's work-list with which most casual listeners will be unfamiliar. In the Nocturne Howell captures its pensive tone as well as those moments of Celtic lyricism that course through its musical veins - tinged as they are with Chopinesque runs; all this makes for a fine opener, as the piece does exert a strong and decisive, veiled and melancholic allure. The Tempo di Valse meanwhile has a rather generic though not unattractive charm. Rather more individual in this respect is the baldly titled but engaging Basso Ostinato which has a swelling grandeur but also a discernable ambiguity that adds to its attractiveness. In general these are concise works, some taken from cycles, though occasionally Stanford can be led into an over-familiar loquaciousness - I find the Caprice in C minor, written just before the First World War, somewhat guilty in that respect. In contra-distinction one of the most impressive of all these pieces is the Ballade in G minor, Op. 170 which is constructed with seamless control, delightfully flecked with limpid, almost folkloric moments and a strong sense of vocalised lyricism. The other Ballade, in F major, is similarly reflective and lyric, though its generosity of spirit is not quite as distinctive, and it coheres a little too much to the Brahms-Schumann-Russian sphere of influence. In the Caprice in D minor Stanford summons up harp-like runs; this Caoine is a most attractive opus, played with especial refinement. Of the two early pieces, the Gigue us particularly zestful. Certainly Stanford's influences are apparent, at least in part, and this has been a constant theme in appreciation of his music - or indeed the denigrating of it. These piano pieces will not change that critical vector. We might want recordings of the complete Opp. 163 and 179 in which Stanford constructed his own '48'. In the meantime this hour-long selection proves desirable.